Home › Utility / Support Vessel › Multi Cat › Multi Cat 2712 › Multi Cat 2712 "Frøy Pioner"
On the 15th of April, 2016 the Multi Cat Frøy Pioner was delivered to the Norwegian company Frøy Vest AS as agreed. 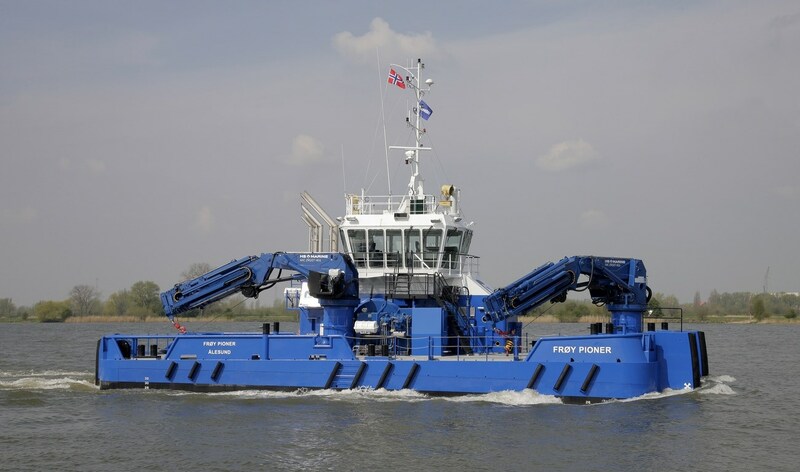 On the 28th of October, 2015 the contract already was signed between Damen Shipyards Gorinchem (Sales Manager Mr. Remko Hottentot) and Frøy Vest AS for the delivery of this MuC 2712 by our yard as well as a Stan Pontoon 4113 by Damen Shipyards Gorinchem (Product Director Pontoons & Barges Mr. Frank Koppelaar). The vessel will be used by Frøy Vest AS especially in the fish farming and aquaculture industry in Norway and therefore at request of the customer heavier cranes were installed at the vessel. With the trials beautiful pictures were made of the Frøy Pioner.